BlackHawk Central Vacuum Attachment Kit - MD Vacuum OFFICIAL SITE. Take the upper hand in carpet grooming with the BlackHawk electric powered brush kit. Blackhawk allows all of the suction to pull debris from deep within the carpet. Compared to air-driven brushes the BlackHawk is quieter, more aggressive, and does not slow down under load. Check out all the BlackHawk Kit highlights then test drive it for 30-days with our 100% Money Back Satisfaction Guarantee. Review the BlackHawk Kit in detail. 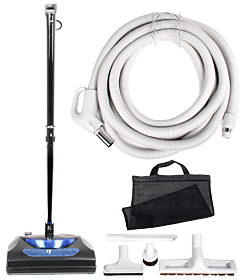 The kit is full of deluxe tools that help make vacuuming every surface in your home as efficient as it can be. Take a moment to look over the kit in detail here. The BlackHawk Kit help you to get the most out of your central vacuum no matter the make, model, or year. It is guaranteed to fit all systems without retrofitting. Review your brand for more information. How does the BlackHawk Central Vacuum Kit match up to compatible electric kits? "What an improvement. I was about to abandon my unit and decided to give it one more try." "Everything works well. Just as I expected it would."